Socks have existed in some form for thousands of years. What started out as something needed for warmth and protection against the harsh material of early shoes has evolved into status symbols, fashion statements, and forms of expression. And because socks now serve a greater purpose than just to cover feet, they will likely exist for many more years. In ancient times, people sewed animal skins and furs together and tied them around their feet for warmth. Knitted socks from as early as 1500 B.C. have been discovered in parts of Europe. In the 5th century A.D., socks called puttees symbolized purity in parts of Europe. 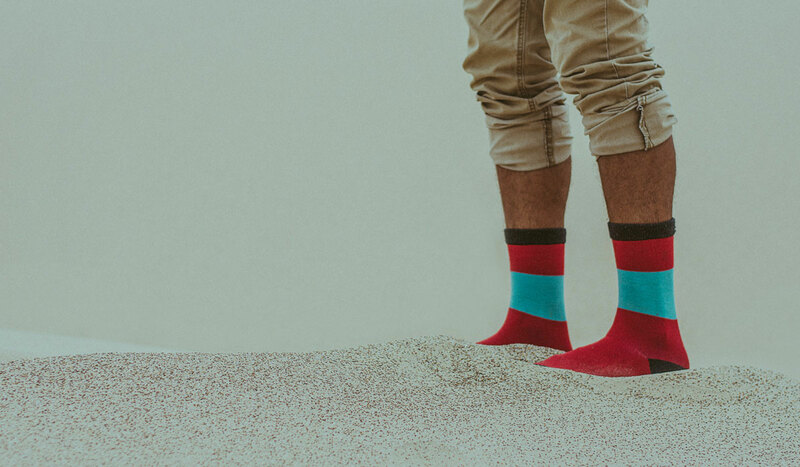 According to some historical accounts, socks became a symbol of wealth by around A.D. 1000, while others suggest this trend actually began somewhere in the early first century. While the working class covered their feet in animal skins and basic cloth, the elite wore colored cloth around their legs secured by garters. In the 15th century, socks became decorative with the first printed sock designs. Elizabeth I is said to have worn custom knit socks (or stockings) of many colors, including carnation pink. Different sock lengths were introduced and worn to match certain attire. During this time period, men were known to wear striped socks as a way to express individuality. This period also saw the invention of a knitting machine, which allowed for faster production of knitted socks. In the 16th and 17th centuries, Spanish influence enveloped all of Europe. Spanish cloth of that time consisted of beautiful fabrics adorned with embroidery and fine jewels. The 19th and 20th centuries introduced the world to tube socks, which peaked in popularity in the U.S. in the late 1960s and ‘70s, as kids became more active in sports like basketball, soccer, track and field, and roller skating. In the last decade, bright, colorful, and patterned socks have become popular as society has shifted more towards accepting individual expression and workplace dress codes have become more lax. For an item that was once considered to be a thoughtless gift, workplaces are now even incorporating their logos into custom dress socks and embracing them as a type of fun corporate gift and marketing giveaway. Socks will always be around because people will always need coverage to keep their feet warm, protection from the friction caused by shoes, and as accessories for their wardrobes. The materials, the styles, and even the functions of socks may change, but after centuries of use, they will never disappear.